Tag Archive | "Cyphotilapia frontosa"
The Frontosa Cichlid (Cyphotilapia frontosa) is a popular pelagic species native to Lake Tanganyika in East Africa where it inhabits the northern half of the lake. Although it is identified by its scientific name as Cyphotilapia frontosa; it is also known as Paratilapia frontosa and Pelmatochromis frontosus by tropical fish keeping enthusiasts. 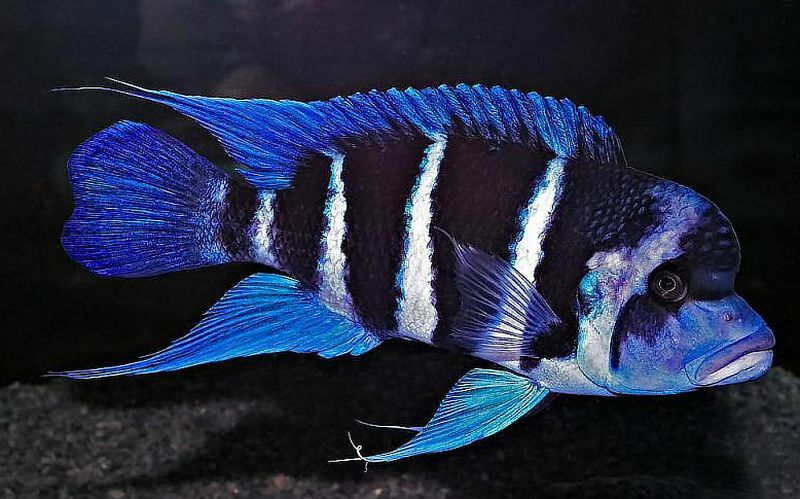 The Frontosa Cichlid (Cyphotilapia frontosa) is closely related to Cyphotilapia gibberosa which is found primarily in the southern half of lake Tanganyika. Frontosa Cichlids are seldom found close to shore. They are nocturnal feeders and in the wild live in large groups called colonies. They prefer living in the 95 to 165 foot depths where they only venture into shallower waters very early in the morning hours to feed on shoaling “Cyps” (Cyprichromis species). 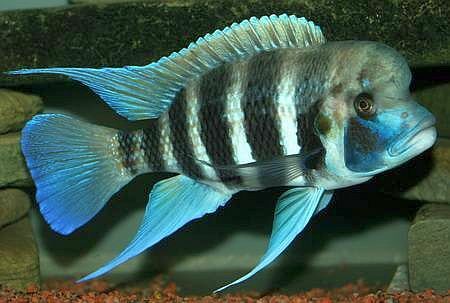 Frontosa Cichlids are identified by their distinct 5 to 7 black vertical bar markings that adorn their white to blue body and head. Their trailing fins have a distinct blue hue to them and both sexes of the species develop a cranial hump which becomes more pronounced as the fish get older. Usually the frontal hump develops when the fish reaches maturity or is about 4 inches in length. like many of the cichlid species found in Lake Tanganyika, distinct breeding colonies have developed into several different color morphs. Frontosa Cichlids grow quite large and will outgrow a small aquarium. They should be housed in at least a 90 gallon tank with a sandy or finely crushed coral aggregate and plenty of rocks aquascaped into caves for them to feel secure. They are easily spooked when sufficient rock work is not present to make them feel secure and because of their size, they have been known to create havoc in an aquarium when spooked. For cichlids, this species is generally not aggressive and are unusually tolerant of other species. They are slow,lethargic, and generally make good candidates for a mixed species cichlid tank. And, they will usually get along with other semi aggressive fish. Frontosa Cichlids are a shoaling species that in a single species tank, are best kept in groups of 6 to 8 fish. This requires a tank of at least 150 gallons and conditions that mimic the waters of Lake Tanganyika, generally hard and alkaline. A pH of 7.8 to 9.0, water temperatures between 79 and 82 degrees and a KH of 10-20 will keep them healthy. Cyphotilapia frontosa are mouth brooders. When males become sexually active, they turn “Kigoma” blue, especially around their snout. The male selects a secluded open spot, often in a cave, where he passes with his fins folded until he gets a willing females attention. He then releases his milt over the spot showing the female where to go to lay her eggs. She will then pass over the spot with her fins folded, drop her egg and back up to pick it up into her mouth. This procedure is repeated several times until spawning is completed. The female holds anywhere from 20 to as many as 80 eggs in her mouth for a period of up to 5 weeks. Even though the female will gather the fry into her mouth at the presence of danger after the eggs have hatched, its a good idea to separate the fry from the adults. Frontosa Cichlids are carnivores and any fish under 3 inches is considered food for adults. In the wild Cyphotilapia frontosa are opportunistic feeders. They prey on the large schools of Cyprichromis species as they sleep. In an aquarium environment they should be fed small, live or frozen feeder fish, krill, ghost shrimp , mysis, and earthworms. Sinking carnivore pellets are also accepted but flake foods should be avoided. In the aquarium hobby, most Frontosa Cichlids are captive bred specimens that are sold when they are between 1 1/2″ to 3 1/2″ in length. Because they are considered a table delicacy, wild caught specimens are not commonly available to tropical fish keeping enthusiasts. Compatibility: Can be kept in groups of 1 male with 5 or more females.